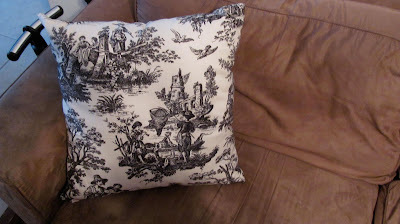 So I FINALLY made some new pillows for myself this weekend. I don't remember what this kind of fabric is called but I love it. My house is mix of wood and black and white and blue so these go really well with the rest of the living room. 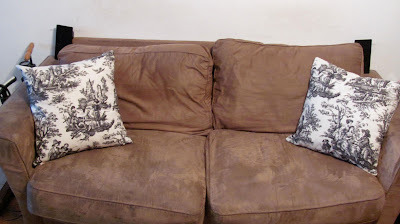 Its about time I had comfortable soft big pillows on my own couch! Oh man the name is on the tip of my tongue! Remember that genteel southern lady designer on Trading Spaces used to use it ALL the time!? SO MANY GUEST MONKEY MAKERS!! Holy crap! they are almost done! 3rd Ward Craft fair photos! New Designs for Saturday's Craft Fair!